When you’re looking for caterers to provide fresh, homemade, tasty food for your party or event, you need ones you can trust, who deliver on time every time and who care about their customer’s needs. With Hog Roast Crewe, you get this and so much more. We’ve spent many years now making sure that we satisfy hunger and provide service with a smile, and our signature hog roasts are often recommended by our long-term customers who return again and again. But what if you have some guests on special diets or what if you need alternative food for guests who prefer something different to eat? With Hog Roast Crewe, you’re still covered in every way. We have various menus on offer so that all the guests you invite can be catered. If you need particular diets catering, we have plenty of options for vegetarians, vegans and gluten-free guests, and our chefs will whip something special up as long as we know in advance. Over the years we’ve catered all kinds of diets, so whatever your needs, just let us know and we will make sure that everyone can enjoy our delicious food on the day of your function. 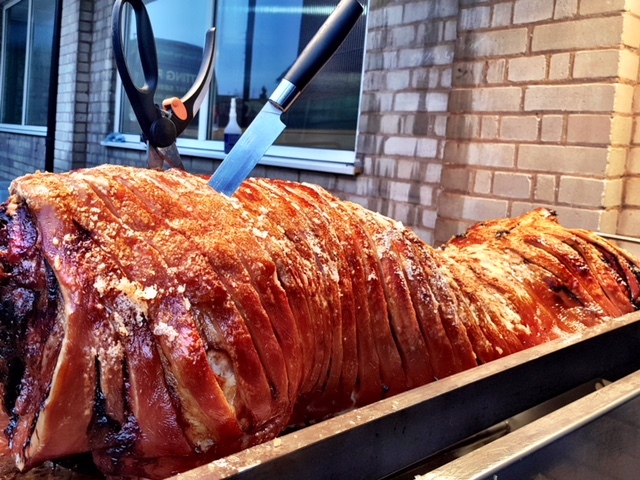 When our repeat customers Jim and Janine called Hog Roast Crewe to book our catering services for their wedding anniversary party a while back, they knew straight away that they wanted us to cook one of our amazing traditional hog roasts, so that we could make pigs in buns (also known as hog roast rolls). Having devoured them a few times in the past already, the couple wanted to impress their friends and family with freshly-cooked meat that melts in the mouth, along with our crispy, salty crackling, and with bits of both crammed into fresh bread rolls and topped with our own scrumptious apple sauce and stuffing, they are to die for. However, one of the guests invited needed a vegetarian option, and our veggie skewers would do the trick. With chunky halloumi and various vegetables, grilled and then served in pitta bread with our Tzatziki dip, they are just as loved as our pigs in buns. Yesterday, on the day of the anniversary do, our chef and team cooked up a storm at the pub garden venue and everyone loved our food, including the vegetarian guest.